The garlic sauce makes ordinary potatoes come to life ! And the steaming creates a really nice consistency for the potatoes – almost creamy without being mushy or mealy. This is a great side dish when entertaining. Place a steamer basket in a medium pot and add 1-2 inches of water. Make sure the water does not touch the bottom of the steamer basket – you want the potatoes to steam, not boil. Place potatoes in the steamer basket. Separate the cloves of garlic from the head, but do not remove the paper thin skins then scatter the garlic in with the potatoes. Cover and steam 20 minutes or until fork can be easily inserted into potatoes. Remove garlic from pan and remove skins by squeezing the garlic up with your fingers and pushing the pulp out. Mash pulp with milk, oil and margarine and warm slightly over low heat. 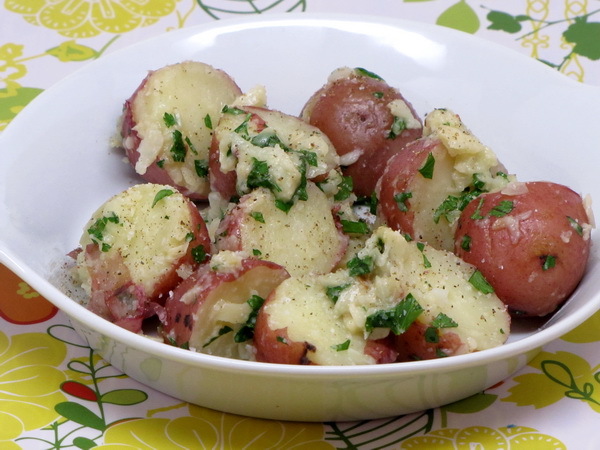 Remove potatoes from pan and cut in half and toss well with the sauce and parsley, salt and pepper.